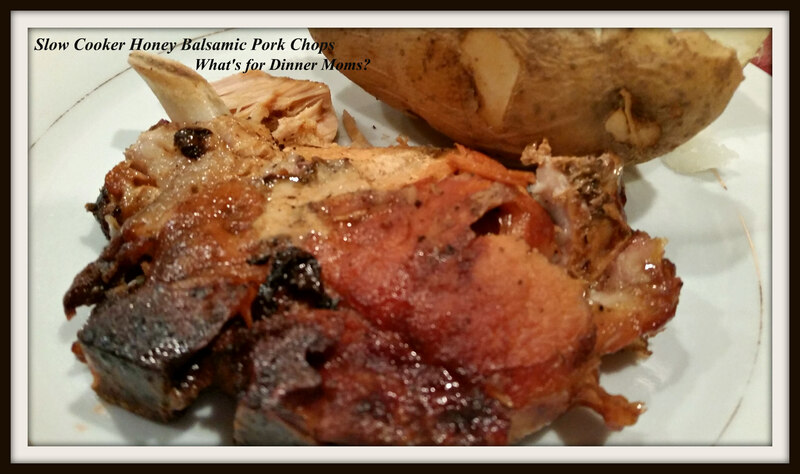 Slow Cooker Balsamic Pork Chops – What's for Dinner Moms? “This is what the Others have done to us. You can’t band together to fight without trust. And without trust, there was no hope. I had to stop after that and talk about it with my children. Is this true? Is this really the best way to keep us apart and fighting by flaming the fire of distrust among the people? This is why I love to read out loud with my kids to this day. We can really find some great things to discuss and ponder together. Just think about those sentences. Very powerful. Which does not segue well into my meal but, such is life. We had another full day planned and I had taken out pork chops for dinner. The slow cooker became the best way to get dinner on the table without us actually having to be there to cook them. The pork chops held together fairly well. Some of them towards the bottom did fall off the bone a bit as we served them. They did not shred but stayed in big pieces. They looked delicious and smelled amazing as they cooked. The only down fall was the flavor. They weren’t bad but they needed more flavor. So at the table we all poured additional balsamic vinegar over the pork. We all agreed the texture was great, the appearance was good just needed a bit more flavor. We served these with baked potatoes, bean and a green side salad to complete the meal. Salt and pepper pork chops. Place in bottom of slow cooker. Mix together honey, vinegar and garlic. Pour over pork chops. Cook on high 2 hours or on low 6-7 hours. Taste and adjust sauce before serving or serve with extra balsamic if desired. Oooo, bay leaves and cracked peppercorns. Sounds delicious. Adding that next time! I love hearing stories of parents reading out loud with their children. Its important at any age. I’ve never heard of the 5th wave. I love reading with my kids. They are 16 and 13 and I hope to continue as long as possible. I think it is important to give our point of view as we are reading things like “The Book Thief.” So far so good on the book. A bit of a strange beginning but it us a NYT bestseller. So true! Discussing literature is going to be an valuable skill set if they decide to go college. Mid-way into the book thief I really got into it. You’re an awesome mom! I really enjoyed The Book Thief! It was one of our favorites. Very powerful words and a great meal! Thank you so very much, Lynn! The words caught me off guard and I had to stop reading for a moment I was so emotional.